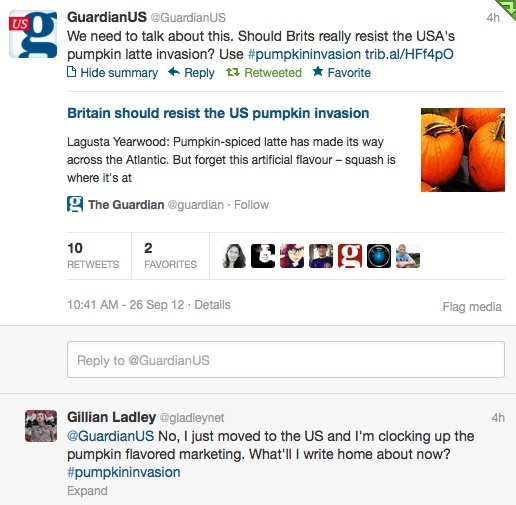 I was unreasonably disappointed to read this Guardian article today that says Pumpkin Spice Lattes have reached the UK. You see, in the USA, the usual holidays aren't the only marketing themes. Everything has a marketing theme. In rural America people don't just decorate their homes for Halloween or Christmas. People decorate their homes for any occasion or season. You'll see spring and Easter wreathes, Fall and Halloween wreathes, Christmas or winter wreathes. You'll see patriotic flags up from July 4th to Labor Day. You'll see reflections of different religious and political beliefs in every corner all year round. I love it because it reflects the diversity in the faiths and backgrounds of people in the US, combined with a uniquely American patriotism. This year in the UK was wonderfully different because of the Jubilee and the Olympics. Usually houses are bare until Halloween and Christmas, when even non-Christians decorate their homes with lights and trees and the like. America, predictably, does it all bigger and better. I think this is partly because of the deep-rooted capitalism in the USA. It's the heart of American history. Any occasion or event can be captured by purchasing a Hallmark card or an item of home decor. I've seen Happy Halloween cards on sale for children to give to - who? But I think it also represents a closeness to nature and the changing seasons. My American friends are all on hopeful hold right now, asking "Is it Fall yet?". The place I volunteer had an unfamiliar scent wafting through the offices which I later identified as a pumpkin spice candle. Mr has been wearing heavy plaid shirts for a week now, willing the cooler air to breeze. A single trip to Walmart was a great source of amusement for this British lady, and it's not even October yet. The best of Fall is yet to come. But if the UK gets pumpkin spice marketing too, what will I write home about? Isn't Germany's Apple Crumble Latte much more fitting for the UK at any rate? Send me your favorite pumpkin spice marketing. Next week the Fall fests start, so I'm determined to have pumpkin themed posts for the whole of October. If you think this is early, just be ready for the onslaught of Christmas decorations after midnight on Halloween. I'm surprised they're not out already! Drives me crazy! I live in Belgium, but I love visiting (family in) the USA. And I recognize so much in this post! Our houses are, compared to American houses, bare until a few weeks before Christmas. Ok, there is that 1 pumpkin and some mums in front of everybody's front door right now, but that's it. I too was a one pumpkin family, up until I moved over. Now we have decorations all over the place. I love the pumpkin season, mainly just because I think pumpkin tastes wonderful. I order the tins of Libby's solid pack pumpkin from Amazon because we just don't have a product that works quite as well as that here in the UK. It makes excellent pumpkin pie but I also love to stir a few spoonfuls through some porridge along with a bit of spice to make a great seasonal breakfast. I think it's a shame that here in the UK we don't make as much of a fuss over the different seasons and holidays, Christmas seems to be taking over as the one and only super holiday (seriously there have been selection boxes and advent calendars in the supermarkets since the beginning of September!). My Dad is very American in his approach to the holidays. He was born in New York and although he was raised all his life in Scotland I think something must have stuck from his short time in the states because his house looks like Blackpool illuminations come December. He'd fit right in to an American neighbourhood. I seem to have inherited that from him. Although, I like to try and keep it slightly more on the tasteful side (my mother's influence) there is no mistaking when it's Christmas in my house either. I realise that I went off on a bit of a ramble but I didn't quite realise how much I like the autumn and winter traditions until I started typing. It's a shame that they've changed so much over here since I was a kid. I can't believe you order libby's online - that makes me laugh! I always like the Scottish 'guising' tradition much more than trick or treat. I remember learning the difference when I moved to Scotland, and we went round people's houses playing the recorder. Poor neighbo(u)rs. That pumpkin febreeze looks gross! Yeah, not sure I'd want my house to smell like it for a month.